A Cake Bakes in Brooklyn: Not Another Cake Wreck! Oops, I did it again. Only worse. This mess is *supposed* to be Arthur Schwartz's family's sponge cake, one that both his grandmother and mother made every year for Passover. So I can't blame the recipe. I was thrilled when, a few months ago, Arthur handed me a folder filled with handwritten family recipes. For years, I've cooked and baked from recipes Arthur posts on his own blog, FoodMaven.com; all have worked beautifully and so I was especially excited to bake from his own family recipes. It started out just fine. Below is the mis en place. 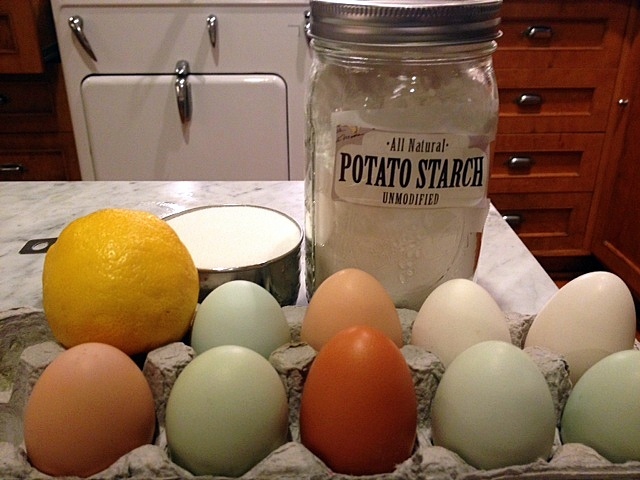 Just four ingredients -- eggs, sugar, lemon and potato starch. The first disaster occurred when I poured the batter into the nine-inch removable bottom tube pan that I had purchased at a flea market. 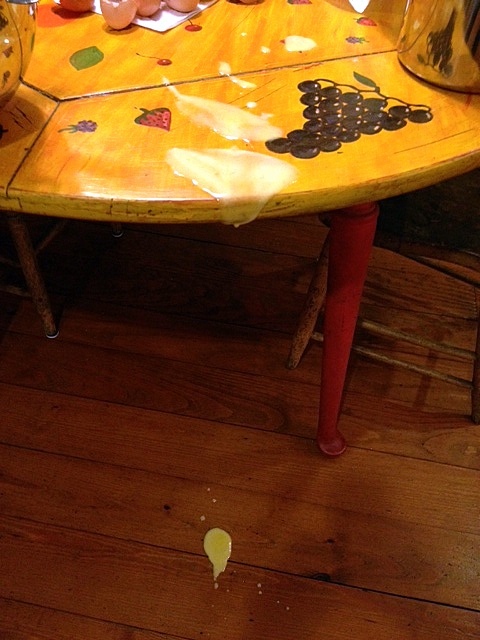 As the batter leaked from the bottom and onto the table and floor, it became all too clear why the pan cost only $1. The cake rose beautifully in the oven and the aroma was so good that even the DS, home for the night, remarked on it. After 40 minutes, the cake seemed done so I removed it and, as per the instructions, inverted the pan until the cake was cool. That's when the "fun" began. Unlike my most recent debacle, where the inverted cake (still warm) fell onto the counter with a thud, this one wouldn't budge. Using one knife to loosen the cake from the pan, and another to bang hard on the top, I attempted to release it, creating so much noise that the DH rushed downstairs to check on all the kitchen commotion. It finally did release, but in five easy pieces. 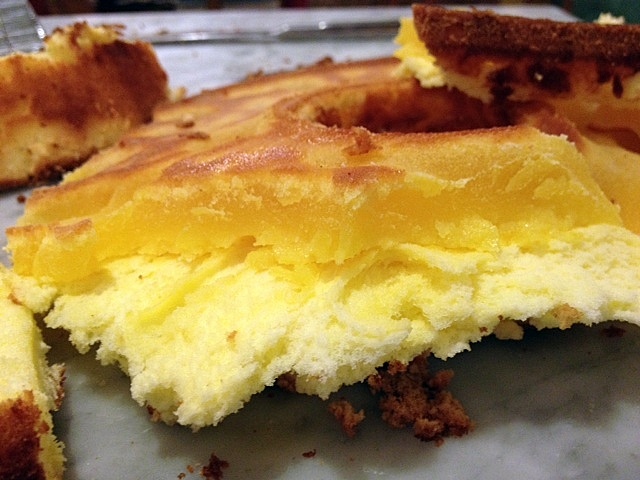 And the top of the cake had a weird, rubbery texture, something I'd never seen and hope never to again. What went wrong? A couple of things. Not having the right pan, for starters. And, looking back, the whites didn't whip well. I used the Kitchen Aid instead of an electric hand mixer (my go-to for this). There was some liquid remaining in the bottom of the bowl and, while the whites were stiff, they seemed to lack volume as I was folding them into the yolk mixture. I also think it could have baked a bit longer. 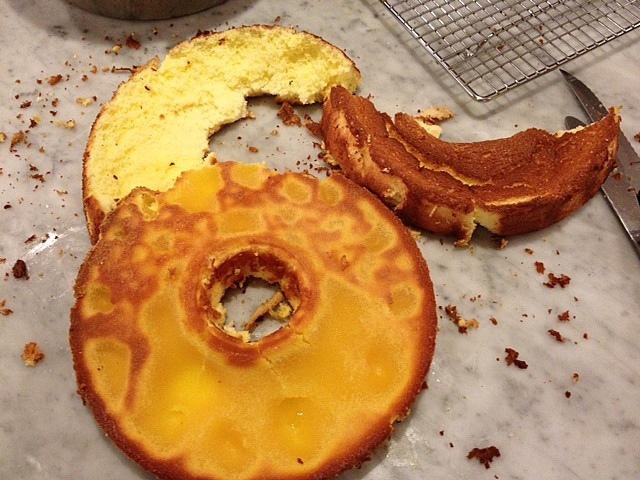 And maybe, just maybe, I'm not meant to make sponge cakes -- this isn't the first struggle I've had with them. 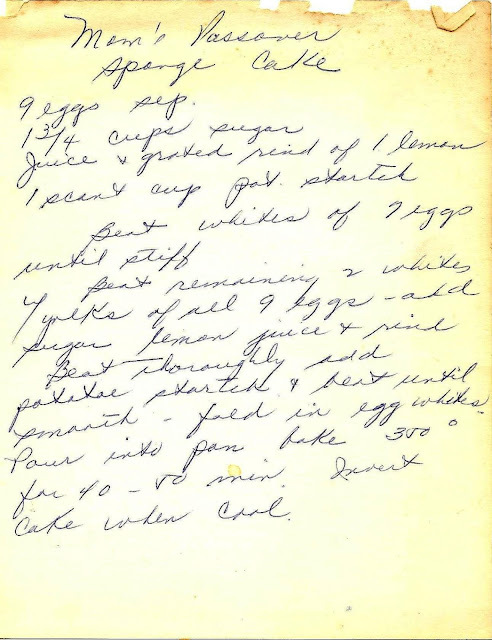 Here's the recipe, written in Arthur's mother's beautiful handwriting. The "Mom" refers to her mother. I may try it again or, more likely, make another from Arthur's collection. Though the pieces of cake that I salvaged were very, very good. Light-as-air texture and a wonderful lemon flavor. Too bad the rest of the cake was heavy-as-lead. I have to say those things have happened to me. I always line the outsides of my pan with foil, just in case!And I hate turning sponge cakes over. That would have made a great Passover cake. Bummer! I figure if one bakes, there will always be some lemons, some failures, etc. It just makes the successes so much sweeter! Honestly I have the worst luck with sponge cakes also. I just always assumed I didn't have quite the right hand at folding in whipped egg whites - but every classic mousse I've ever made has turned out divine. I think sponge cakes just hate me and I'm working on convincing myself that I don't like them either, just to make my life easier. Ace, the whipping and folding of the whites is tricky indeed. I don't really care much for sponge cakes, so even when they fail, my disappointment isn't too bad. Maybe you feel the same way?